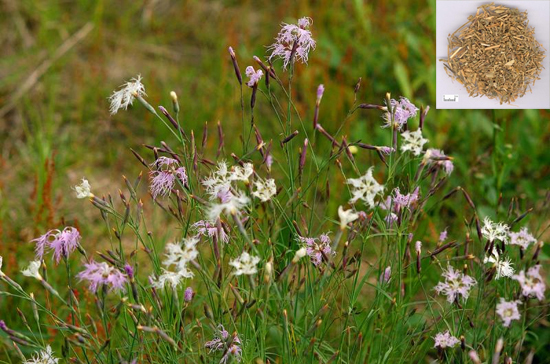 Common Name: Dianthus, Pink, Pink dianthus herb. Herba Dianthi is produced chiefly in the provinces of Hebei, Henan, Liaoning, Hubei, and Jiangsu. The herb is collected in summer and autumn, cleaned, dried, and used unprepared. Meridians: Heart, small intestine and urinary bladder. Functions: 1. To promote urination and regulate abnormal urination; 2. To invigorate blood circulation. 1. Damp-heat in the urinary bladder manifested as scanty urine with blood, painful urination, frequent urination and urgency of micturition. Pink (Qumai) is used with Clematis stem (Mutong), Talc (Huashi) and Common knotgrass (Bianxu) in the formula Bazheng San. 2. Amenorrhea from blood stagnation. Pink (Qumai) is used with herbs that invigorate blood circulation, such as Peach seed (Taoren) and Safflower (Honghua). Cautions & Contraindications: Contraindicated for use during pregnancy.